Godzilla FAQ is a broad and varied exploration of the monumental, fire-breathing radioactive lizard that has roared his way into our hearts over a sixty-year reign of terror. By pairing a colloquial text with a wide array of illustrations and visual media, this 400-page survey encourages readers to drop in and out of the book, as every chapter serves as a self-supporting article on a given subject. 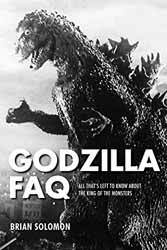 Written by Brian Soloman, a lifelong Godzilla fan and pop culture critic, Godzilla FAQ offers a comprehensive rundown of every Godzilla film ever made, in-depth biographies of major players in the franchise's history, and enough raw information to rebuild a ravaged Tokyo. It goes without saying (yet here I am saying it anyway) that this is only going to be of interest to Godzilla fans or those who want to learn more about the mighty beast. It works well for the casual fan (i.e. me) as well as for the more hardened nut (yes, I have a friend who is a huge Godzilla fan who also read this to see if there were any glaring anomalies). This book delivers everything you'll need to know, from the creature's origins and first appearance in Gojira; a look at the people behind the scenes responsible for bringing the beast to life (from his creator, the man in the suit, the music and the special effects); global events at the time which helped shape the franchise's path; a look at the fans; and many more areas which you probably thought you didn't need to know about, but believe me, you do. The book is designed to be consumed in bite-sized segments, each chapter containing its own beginning, middle and end. But I found the flow to be so engaging and natural that I read it from cover to cover over the course of a few days. It's well written and illustrated and will be warmly welcomed by any Godzilla fan.